As reported today in the journal Nature Nanotechnology, the IBM team's results show size-based separation of bioparticles down to 20 nanometers (nm) in diameter, a scale that gives access to important particles such as DNA, viruses and exosomes. Once separated, these particles can potentially be analyzed by physicians to reveal signs of disease even before patients experience any physical symptoms and when the outcome from treatment is most positive. Until now, the smallest bioparticle that could be separated by size with on-chip technologies was about 50 times or larger, for example, separation of circulating tumor cells from other biological components. IBM's results show they could separate and detect particles as small as 20 nm from smaller particles, that exosomes of size 100 nm and larger could be separated from smaller exosomes, and that separation can take place in spite of diffusion, a hallmark of particle dynamics at these small scales. With Mt. Sinai, the team plans to confirm their device is able to pick up exosomes with cancer-specific biomarkers from patient liquid biopsies. "The ability to sort and enrich biomarkers at the nanoscale in chip-based technologies opens the door to understanding diseases such as cancer as well as viruses like the flu or Zika," said Gustavo Stolovitzky, Program Director of Translational Systems Biology and Nanobiotechnology at IBM Research. "Our lab-on-a-chip device could offer a simple, noninvasive and affordable option to potentially detect and monitor a disease even at its earliest stages, long before physical symptoms manifest. This extra amount of time allows physicians to make more informed decisions and when the prognosis for treatment options is most positive." With the ability to sort bioparticles at the nanoscale, Mt. 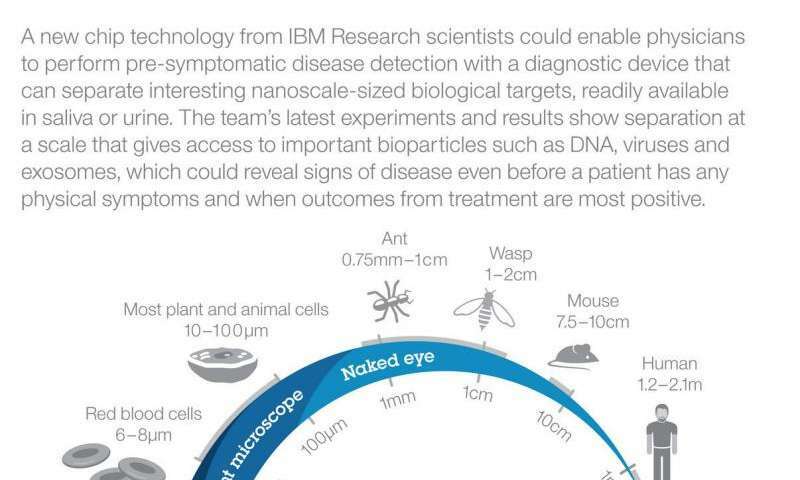 Sinai hopes that IBM's technology can provide a new method to eavesdrop on the messages carried by exosomes for cell-to-cell communications. This can elucidate important questions about the biology of diseases as well as pave the way to noninvasive and eventually affordable point-of-care diagnostic tools. Monitoring this intercellular conversation more regularly could allow medical experts to track an individual's state of health or progression of a disease. "When we are ahead of the disease we usually can address it well; but if the disease is ahead of us, the journey is usually much more difficult. One of the important developments that we are attempting in this collaboration is to have the basic grounds to identify exosome signatures that can be there very early on before symptoms appear or before a disease becomes worse," said Dr. Carlos Cordon-Cardo, Professor and Chairman for the Mount Sinai Health System Department of Pathology. "By bringing together Mount Sinai's domain expertise in cancer and pathology with IBM's systems biology experience and its latest nanoscale separation technology, the hope is to look for specific, sensitive biomarkers in exosomes that represent a new frontier to offering clues that might hold the answer to whether a person has cancer or how to treat it." Lab-on-a-chip technologies have become an incredibly helpful diagnostic tool for physicians as they can be significantly faster, portable, easy to use and require less sample volume to help detect diseases. The goal is to shrink down to a single silicon chip all of the processes necessary to analyze a disease that would normally be carried out in a full-scale biochemistry lab. Using a technology called nanoscale deterministic lateral displacement, or nano-DLD, IBM scientists Dr. Joshua Smith and Dr. Benjamin Wunsch led development of a lab-on-a-chip technology that allows a liquid sample to be passed, in continuous flow, through a silicon chip containing an asymmetric pillar array. This array allows the system to sort a microscopic waterfall of nanoparticles, separating particles by size down to tens of nanometers resolution. IBM has already scaled down the chip size to 2cm by 2cm, while continuing development to increase the device density to improve functionality and throughput. Much like how a road through a small tunnel only allows smaller cars to pass while forcing bigger trucks to detour around, nano-DLD uses a set of pillars to deflect larger particles while allowing smaller particles to flow through the gaps of the pillar array unabated, effectively separating this particle "traffic" by size while not disrupting flow. Interestingly, IBM scientists noticed that nano-DLD arrays can also split a mixture of many different particle sizes into a spread of streams, much like a prism splits white light into different colors. The continuous flow nature of this technology circumvents stop-and-go batch processing typical of conventional separation techniques. 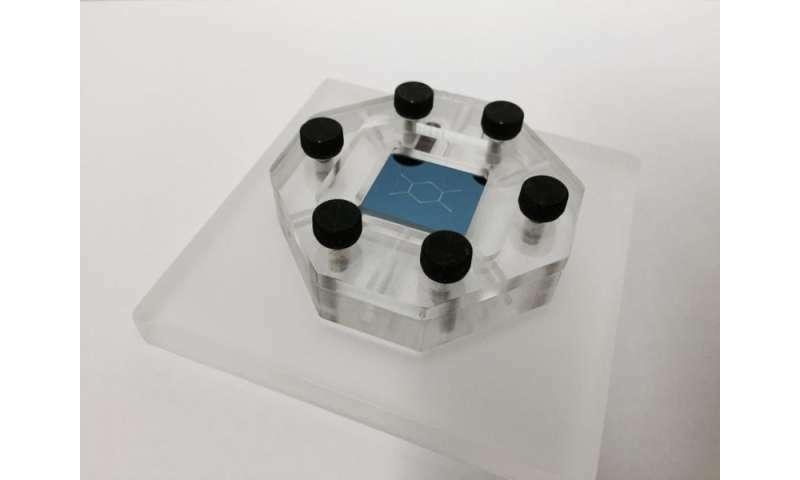 Leveraging IBM's vast semiconductor expertise with its growing capabilities in experimental biology, IBM scientists used manufacturable silicon processes to produce the nano-DLD arrays for their lab-on-a-chip device. As part of its on-going strategy, IBM researchers are working to increase the diversity of bioparticles that can be separated with their device, and improving the precision and specificity for real-world clinical applications.